Software development has been my passion since 1976, living in Silicon Valley, when my father introduced his 12-year-old son (me) to COBOL. I wrote my first application using a teletype at the Lawrence Livermore National Laboratory, and in 1978 I discovered the Apple II. 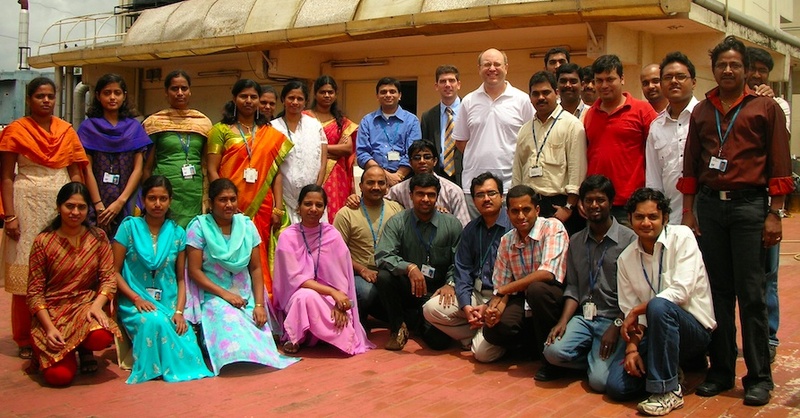 This was my J2EE/Java team at Hewlett-Packard, in Bangalore. About 5 team members were working in Germany, not shown. This was just an incredible collection of talent and energy, and at all levels from senior engineer to senior tech lead and architect. Fast forward thirty years, and here I am, on the top of our building in downtown Bangalore, surrounded by my Java/J2EE team. Because this unique delivery model was so successful for German projects, we later added an SAP/ABAP team, and a software quality / test factory team. After three years, this organization delivered over 100 projects for over two dozen customers, using every imaginable Java framework, toolkit, methodology, product, and platform. After a career spent in software development, I’ve come to one conclusion (you can even call it Ritley’s Law because I believe in it so strongly): no topics in software development are more important than the art of software estimation. No software project begins without an estimate, and all other factors (talent of resources, clarity and stability of requirements, weighted importance of non-functional requirements) are all subservient to and inputs for this one task. In the beginning as an IT consultant, my colleagues and I really struggled in this area. And it doesn’t help matters when the sales managers put pressure on you to lower your estimates (so they can win the business), but later the account managers put pressure on you for scope creep and gold-plating (so they can keep the business). But after my time in Bangalore, being asked to deliver so many projects, and therefore having great chances for trial-and-error, we thought we finally hit the nail on the head. Together with my top colleagues like Srinivas Ivatury and Santhosh Kackattil, we refined an estimation methodology. We applied this in well over a dozen complicated projects, always with stunning results. And when I l showed this approach to my colleagues at the Swiss Federal Railways like Stefan Kühnel (Master Architect), it also appeared to work very well.